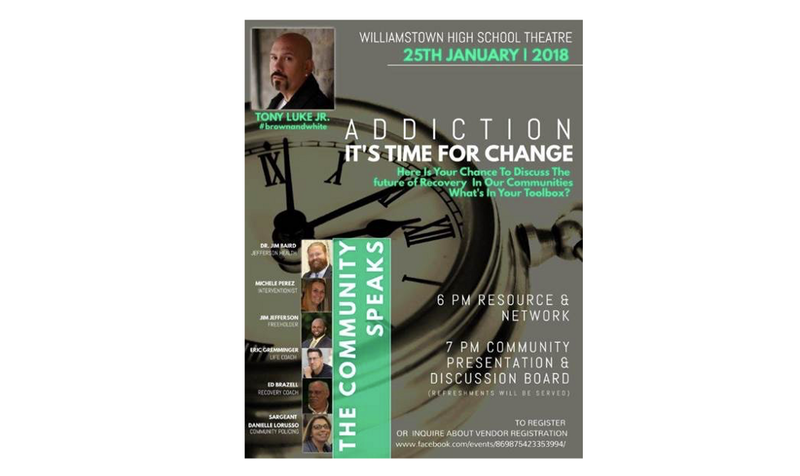 The Monroe Township Municipal Alliance invites everyone to attend “Addiction, It’s Time For Change,” a chance for residents to discuss the future of recovery in the community on Thursday, Jan. 25. The event, held in the Williamstown High School Theater, will begin with resource and networking tables at 6 p.m., followed by a community presentation and discussion board at 7 p.m. Speakers will include Parent Advocate Tony Luke Jr., Jefferson Health Systems Dr. Jim Baird, Municipal Alliance Chairperson and City of Angels Co-chairperson Michele Perez, Gloucester County Freeholder Jim Jefferson, The Santuary Recovery Center Life Coach and COO Eric Gremminger, Gloucester County Prosecutor’s Office Sgt. Danielle Lorusso, Mayor Dan Teefy and more. It’s been more than a year that multiple programs, services and support have been in effect with hospitals, law enforcement and schools. It’s a collaborative effort initiated and speared from a local doctor, the township’s Municipal Alliance, Gloucester County Prosecutor’s Office and City of Angels. Hear from key individuals who make it all happen. You won’t believe what they are doing next. They want to hear from you in the open panel board discussion. Refreshments will be served and door prizes will be awarded. To RSVP or inquire about vendor registration, visit the Monroe Township Municipal Alliance on Facebook.